Much of the hard work of writing is solitary, face to face with only a screen or notepad. Honing the craft of wordsmithing, like sharpening a tool, also requires contact, friction, and even a few sparks. Writing workshops provide all of those elements: contact with fellow craftspeople, the friction of constructive criticism, sparks of inspiration that fly from new perspectives and dedicated writing time. The most effective sharpening requires some preparation ahead of time, which varies depending on the workshop’s form and function. One workshop’s focus may be helping writers get words on the page, while another aims to rework scenes, develop characters, or create dialogue. Another may provide space and time to think and write. Kathleen considers that workshop, part of Story Circle Network Women’s Writing Conference in Austin, Texas, a high point. Workshops and exercises like the one Kathleen attended at Story Circle Network require vulnerability and honesty, but little or no homework. Workshops that aim for more measurable results may require writing to be submitted in advance to leaders and fellow participants. Still other workshops are selective, like those conducted by the Community of Writers at Squaw Valley or the Kenyon Review. Writers who wish to be considered for these sessions must submit an application, including samples of their best work. John Yewell and Mimi Herman lead Writeaways in locations that help writers get away from daily life to focus on their writing. Their greatest tip for writers to prepare for a workshop: come ready to be flexible, with your mind open to new ideas. 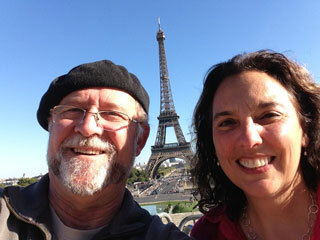 John Yewell and Mimi Herman lead Writeaways retreats in the United States, France, and Italy. For Writeaway by the River in North Carolina, John and Mimi require writers to submit work in advance, but not for a selection process. Instead, they encourage participants to send writing that is not yet perfected. For the Writeaways in France and Italy, writers don’t need to submit any work ahead of time. They can come with a project in progress or a goal to meet, but John and Mimi encourage them to bring an open mind as well. Participants spend the first day or two in private conferences with John and Mimi to refine what they want to do with their time during the week. “Even people who think they know what they want to do often find themselves changing their minds after they arrive,” says Mimi. She advises writers to come prepared to be flexible. 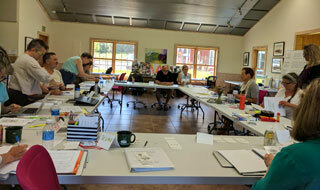 Mary Carroll Moore leads a variety of classes and workshops, including weeklong writing retreats sponsored by Madeline Island School of the Arts. Before those one-week intensive sessions, Mary asks writers to send their writing projects to her. This gives Mary a sense of each student’s reason for attending and goals for the workshop. During the winter retreats—held in Tucson, Arizona, and Santa Fe, New Mexico—students meet daily for three-hour workshop sessions. 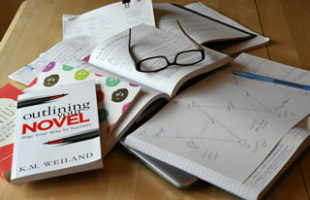 They also have one-on-one coaching sessions, optional activities, and unstructured time for writing. Mary also leads one-day workshops, and eight-week online programs for The Loft Literary Center in Minneapolis. Some of Mary’s workshops are focused on building storyboards for scenes or image boards for characters, so part of the writer’s preparation is gathering materials, such as poster boards, magazines, and glue sticks. For free-writing exercises, she asks writers to bring significant objects for themselves if they are memoir writers, or for their characters if they are writing fiction. Mary Carroll Moore always leaves time in her workshops for generative writing and group interaction, both of which score high points from participants. She also encourages writers to review the writing they want to focus on at the workshop and know what they want to gain from the experience. Kathleen, with three published novels under her belt, has reaped the rewards of varying types of writing workshops, including competitive ones. A fiction contest sponsored by SouthWest Writers gave her the push she needed to finish her first novel, The Final Salute. Award-winning novelist Kathleen Rodgers has attended a variety of workshops that have helped her focus on completing her novels and honing her craft. 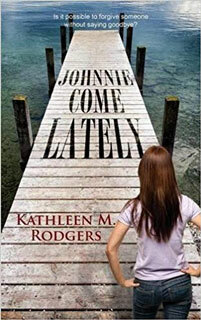 For her second novel, Johnnie Come Lately, Kathleen says she attended a workshop that helped her stay focused and finish the manuscript. Another was all about polishing her story and her words. In that workshop, participants had to read their work out loud to the group. Critique is often an important part of a workshop. Learn how to positively participate in the writing community. Some of the guidelines Mary uses in her workshops: When giving feedback, the more you offer the others, the more you’ll get. Give encouragement, as well as criticism. Use questions, which can open doors and help them see a new perspective. While being critiqued, resist the urge to comment or defend your work. Otherwise, peers don’t feel the freedom to respond fully. Wait until the feedback is done to respond and ask questions. Separate the story from the writer. The feedback or critique is for the story, not for the person who experienced it or wrote it. Of course, it takes a measure of courage. Baring one’s soul and manuscript can be a fearful prospect for any writer, but vulnerability is required to reap the benefits of critique and feedback. Mary leads weeklong winter writing retreats through Madeline Island School of the Arts. Mary’s classes through The Loft Literary Center include one-day classes in Minneapolis and eight-week classes online. Photo of John Yewell and Mimi Herman courtesy of John and Mimi. Storyboarding workshop photo courtesy of Mary Carroll Moore. Feature photo by Karen Pavlicin-Fragnito, who is preparing to attend Mimi and John’s Tuscany Writeaway. Books appearing in the photo include Story Genius by Lisa Cron, Outlining Your Novel by K.M. Weiland, and Weiland’s Creating Character Arcs Workbook, all recommended by fellow writers at a recent MNSCBWI writing workshop. Terri Barnes is a regular contributor to Books Make a Difference magazine, author of the book Spouse Calls: Messages From a Military Life, and senior editor at Elva Resa Publishing (a publisher specializing in books for and about military families). She leads writing workshops about newspaper writing and personal journaling, and she daydreams about taking a writing retreat in the English countryside. This article was first published October 2018.